The FCS Flush Mounted Casing Spiders are a family of tools specifically designed for casing handling operations. All FCS tools mount inside the rotary and eliminate the need for special rig floor platforms when running casing. The FCS tools fit into the rotary table and generally mount flush with the rotary table top. The FCS is designed to fit NATL and LTI rotaries. Adapter rings are required for OILWELL, WIRTH, EMSCO & IDECO rotaries. FCS slips are 4 segments, designed to handle casing sizes 30” - 4 1/2”. Hydraulic operation 10 gpm at 2500 psi. The FCS can be removed from the pipe and rotary table with pipe in the hole. Pipe guides are installed in the top cover. 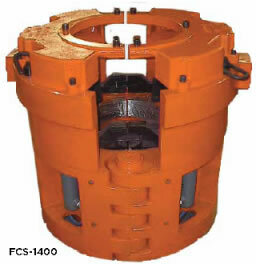 FCS-1400 uses standard 500 ton Elevator/Spider slips.